Operation Blue Star in 1984 - to flush out separatists from sacred Golden Temple - is one of the most controversial and at the same time one of the most impactful incidents in recent history of India. There are several books written on this topic and several accounts by journalists are available. 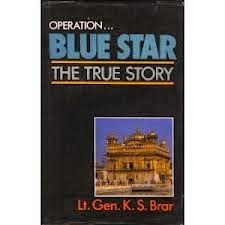 Out of them, I have shortlisted 'Operation Blue Star, The True Story' by Lt. Gen. K.S. Brar and 'Operation Blue Star, Indira Gandhi's Last Battle'. Even Journalist Tavleen Singh devotes one chapter to the Operation and pre and post-operation scenarios in her book 'Durbar'. I started with the book penned by K.S Brar because he was there for the whole duration of operation and also because I wanted to know how military makes and evolves their strategies. Having said that I have always believed that to get a neutral picture of any historical event one has to read as many contrasting views as possible and then form his own opinion based on arguments put before him for it is very easy to get carried away by reading one side of a story. K.S. Brar was a Major General stationed in Meerut when he was told to report to Western Command of Indian Army. In fact, he was planning a foreign trip with his wife and had to abandon that in view of the task assigned to him. On questions of him not being assertive enough in asking more time for being prepared as Gen. Manekshaw did during Bangladesh Liberation War, Gen. Brar says that the fear of groundswell in favour of Bhindranwale was so real that any further delay would have further aggravated the already serious situation in Punjab. He was given four days to gather necessary intelligence and make his strategy, which he did in due time. All preparations such as cordoning off the area, army's takeover of law and order situation in Punjab and making vantage points outside the periphery of Golden Temple premises were done during this time. During actual operation, the army was surprised by the firepower of Bhindranwale and his associates. Also in presence was a battle-hardened retired army officer Shabeg Singh who trained separatists so well that they could hold ground for such a long time as was thought necessary for the news of the attack on Golden Temple to reach to villages and a movement of peasants towards Amritsar could start. Several fortifications and placement of heavy guns, even rocket launchers, tells the level of preparedness and also the acumen of Shabeg Singh. I wondered why Shabeg Singh was so angry with establishment and I got the answer in Tavleen Singh's Durbar. Shabeg Singh was stripped from military services just one day before his retirement on some corruption charges and because of that he could not avail retirement benefits. For an officer who was highly lauded for his role in Bangladesh-liberation War of 1971, this was too humiliating and he said that all this was done because he was a Sikh. No effort was made to address the concern of Shabeg Singh which was a grave mistake. As army miscalculated the preparedness of separatists, reinforcements were called. Having suffered heavy casualties, tanks were brought inside Golden Temple premises. Although K.S. Brar repeatedly tells us that tanks did not use their main guns and their primary purpose was to provide cover to soldiers but the picture of Akal Takht after Operation tells another story. Although for the fate of Akal Takht, Bhindranwale was no less responsible, as he took shelter in Akal Takht where even no Guru resided. Brar says that the fear of Bhindranwale's associates blowing Harmandir Sahib to provoke the sentiments of masses was very real and that is why soldiers were sent at the earliest possible time. By next day afternoon, the operation was declared successful. Brar takes this opportunity to refute many allegations. Brahma Chellaney, then reporting for Western media, sent a dispatch that Sikhs were mass-killed after tying their hands backwards. Brar says that all the persons in the premises including devotees were tied when hostels and sarais were secured so that the militants can be separated from devotees after verification by police and intelligence agencies. In one such a process, a scuffle broke out between a militant and army personnel and he was killed, but Tavleen Singh gives an altogether different account significantly reducing the credibility of Brar's theory. She says that while going towards Amritsar, she saw a truck full of bodies of Sikhs with the turban tied over their mouths and hands tied over their back. It was such a telling picture of the situation in Punjab. Brar also refutes reports that he was seen in person inside the premise. He says in that case if he would have been captured or killed inside, it would have hampered the whole operation. One question which Brar brings for discussion is that whom should army has its allegiance to - the nation or the government. Brar says that 'loyalty to the nation' is very vague term until there is an authority which is thought to represent the nation and in this case it was a duly elected government. Army officers and soldiers getting killed in action and later getting blamed for the bloodshed is not acceptable as they were following government orders. Both state and central governments should be blamed for mishandling the situation both before the operation leading to military intervention and post the operation causing mutinies by soldiers at few places and the 1984 riots. With decisive governments, these incidents could have been avoided.